Educate Global 2.0 is history. China looms in the rearview mirror. A new semester of learning is underway in DeKalb. But the broadened perspectives Educate Globalprovided to NIU’s future teachers seem destined to persist in countless and unpredictable ways. Just ask Bethany Johnson, a senior Early Childhood Education major. “It’s just being more conscious about what it’s like to be an outsider,” says Johnson, from Arlington Heights. 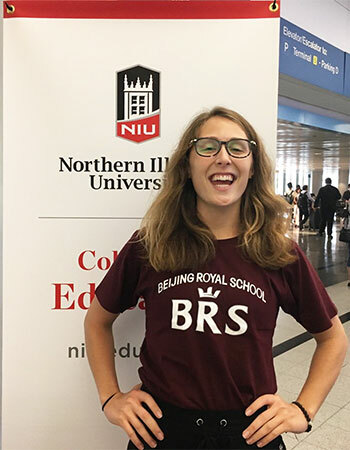 And after spending her summer teaching English to Chinese students at the Beijing Royal School, she has gained a powerful understanding of the need to make learners feel comfortable and confident. Because using visual aids to connect images to English words proved effective, she now thinks that same strategy could work in U.S. schools of young children. So would a teacher who is accepting of who and where children are, she says. 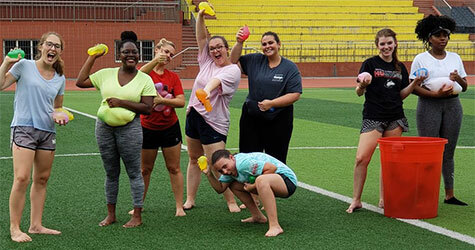 One of 10 NIU College of Education undergraduates who traveled to China from early July through mid-August to teach middle- and high-schoolers ages 10 to 16, Johnson loved the trip that Assistant Professor Stephanie DeSpain encouraged her to take. Educate Global provides round-trip airfare, room and board in the Beijing Royal School dormitory and cultural tours at no cost to the students or the college. Students who make the journey also can apply for the university’s Engage PLUS Academic Transcript Notation, which demonstrates such skills as critical thinking, organization and teamwork to employers and graduate programs. They tried to make the camps as fun as possible with outdoor games, water balloon battles and talent shows. They learned the need to differentiate their instruction and, if necessary, scrap their lesson plans and start anew. They discovered the importance of flexibility. For example, Meurs and co-teacher Abby Spankroy realized that some students needed writing prompts to spur their output. They also asked the students to teach them Chinese words. One task assigned the Chinese students to draw pictures of their homes and then write English adjectives to describe them, she says, but that seemed beneath their skills. To replace that activity, the NIU teachers asked their students to write biographical poems. Spankroy heard about Educate Global from classmate Alexis Moaton, who made the trip last year and returned again this summer. Further encouraged by professors Melanie Walski and James Cohen, Spankroy eventually returned to the United States with the happiness of making an academic impact – and with a greater cultural awareness that will shape her career. That lesson also hit home for Sarah Williams, a senior Special Education major from Elgin. 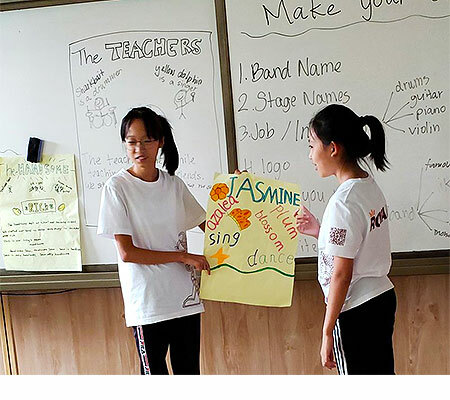 Williams and her co-teacher developed a theme of music for their campers, focusing on the terminology of music, but discovered that “the bridge between basic English vocabulary and music vocabulary” wasn’t connecting. “Sometimes you make a plan, and you have to throw it away because it won’t work,” Williams says. Meanwhile, Williams expanded her scope of experience. While her degree is preparing her to work with students from kindergarten through age 21, most of her encounters so far have been on either side of that spectrum. The Chinese students fell in the middle. Like the others, she also is preparing for a career in the classroom with her eyes opened. 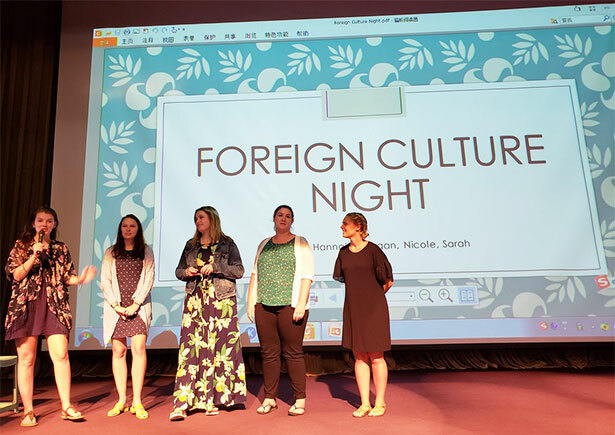 Other teacher licensure candidates who traveled to China this summer were Hannah Schlecht, Emma Shade Fischer, Moesha Swanigan and Nicole VanGarsse.